Genuine escape proof dog crates are few and far between, however they do exist. If you are reading this, then the chances are that you have an escape artist canine friend! Some breeds of dog are very powerful animals with strong jaws and can indeed chew and gnaw their way through wood and even metals if given enough time and opportunity. An example of an active dog is the Pitbull. That said, even the mild strength breed of dog will always find weak points to exploit. Some owners keep their dogs crated for a substantial period while unsupervised, so it stands to reason a bored animal will put their mind to escaping. A heavy duty crate could be a sensible investment if you value your furniture and possessions. Many dog owners have returned home to find furniture and valuables destroyed by their escaped dog. An indestructible crate can potentially save you much money as well as providing you with peace of mind when away from home. Escaping is another factor to consider. Could you imagine coming home and finding your lifelong companion has escaped and is nowhere to be seen? You might fly with your dog regularly; therefore, a tough crate would be a requirement for airline travel. Before you venture into the buying process, you will want to know what size crate you will need for your dog. You can use our Dog Crate Size Guide for more information. You will also want to consider whether you need portability – There are crates on the market today that is both collapsible and heavy duty. One of the key things to consider when choosing an escape proof crate is the build quality. A poorly made crate could cause serious harm to your pet if they attempt to flee. Bent metal, jagged edges, and brittle plastic all can cause serious injury to an animal. If you want a portable crate, then the building materials will be a huge factor to consider – For example Aluminum is both strong and lightweight! Steel is more durable and heavy but might not be a huge issue if the crate will be only used at home. It is advisable always to prepare for the worst. Nothing is 100% guaranteed, and there is always the possibility of your dog escaping. Cheaper Dog Crates are more at risk as they may scrimp on the quality of the materials used therefore they might not be as robust as their more expensive counterparts. We have looked at a range of durable and almost indestructible dog crates ranging from budget to premium giving you the information, facts and related tips you need when considering whether or not you will want to purchase. We have collected the data and provided you with a comparison table which includes product information such as materials used, weight and what budget category they fall. We have also compiled a top 3 list consisting of the best budget, mid-range and premium dog crates that fall into the ‘escape-proof‘ category. If you want the best, look no further. A real premium dog crate with a price tag to match. Money well spent though if you appreciate quality. The crate is in the USA with high quality .063 aluminum making it 20% lighter (41lbs) than similar crates in the same category and also corrosion resistant. Furthermore, this crate is easily collapsible to less than 8 inches in height. 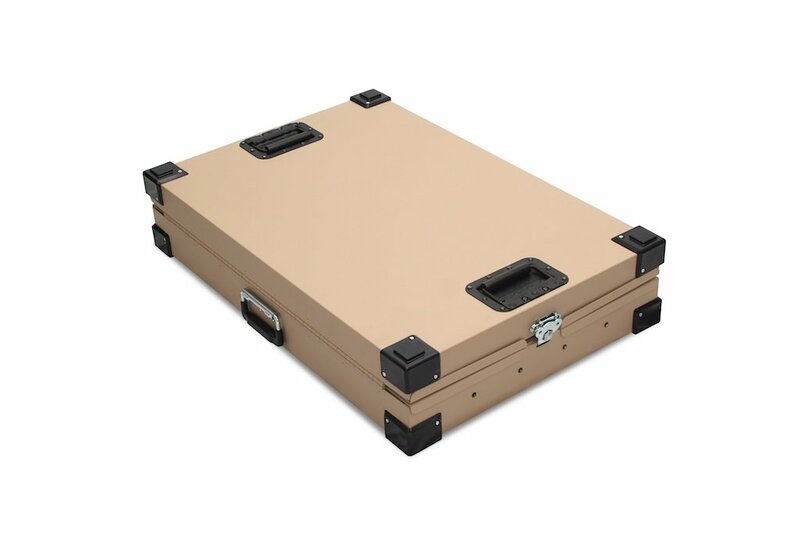 Security is the key design focus made with a very sturdy metal which features welded rivet construction and 3/8 inch bars which give the crate extra stability. For less hassle, the latch automatically locks into place. 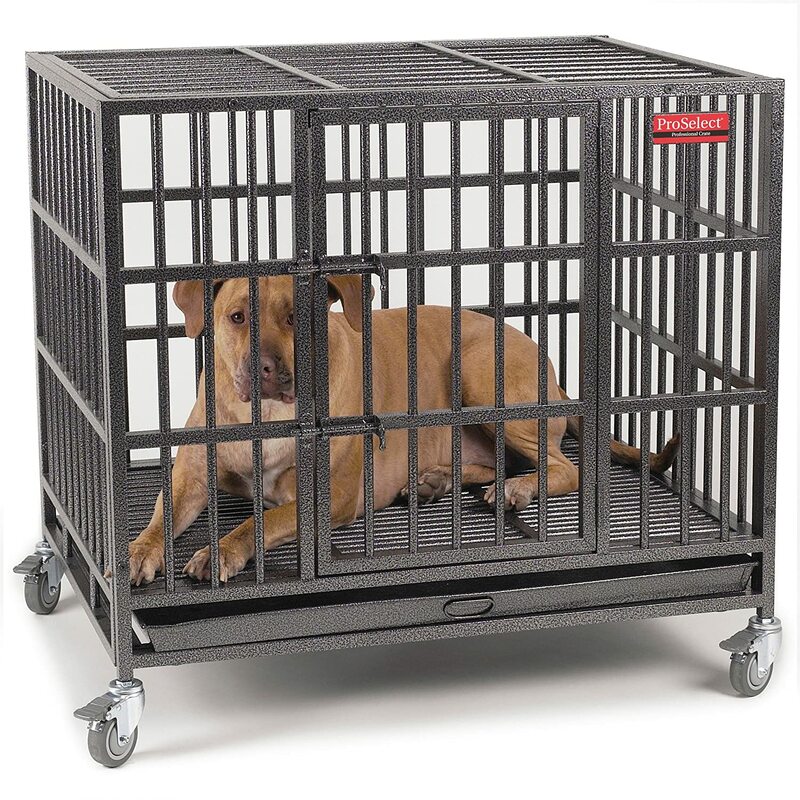 This crate is a heavy duty industrial style crate that is virtually inescapable but also retains a kennel-like appearance that may help your dog feel at home. This is especially important if you have an anxious dog. 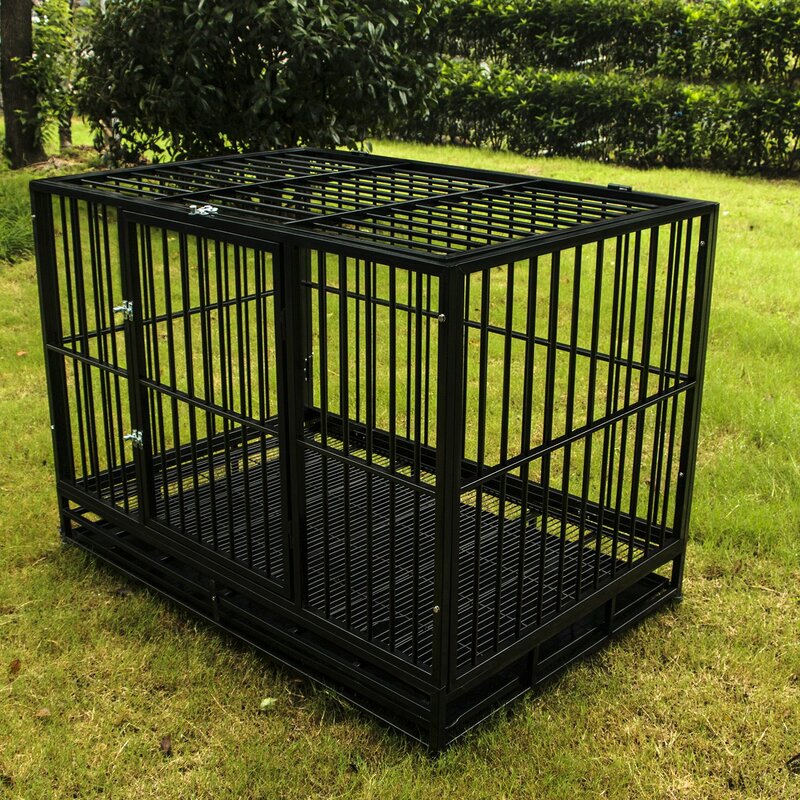 If you have a strong and powerful dog, this crate will be very appealing. The health of your pet is also a key design focus as this crate has ventilation on all four sides giving superior air flow. The dog crate contains no harmful dyes, chemicals or toxins in any of the construction materials. It comes in a wide range of sizes to suit all dogs including X-large, Large, Medium and Small. If you need help crate sizing your dog – please use our dog size table. It also comes in a variety of colors – Tan or Gray, Lime Green, Purple and Blue giving you greater ability to match it to your home décor or suit personal preference. This crate certainly earns its premium status by encompassing many elements into one single unit – Escape-Proof, Lightweight, Collapsable. This dog crate will surely keep the most powerful dog secure and will last for the lifespan of your dog at least. If you value all of these advantages as well as the peace of mind, it will give you, buying this crate will make a great long-term investment. 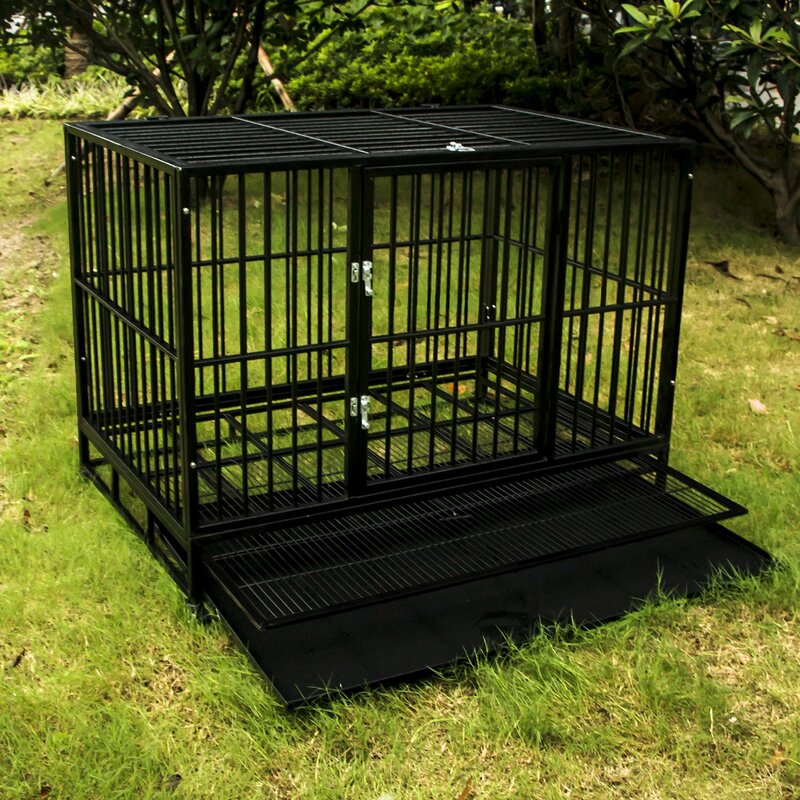 The Proselect Empire range of crates represents an excellent mid-range option if you want a crate to house aggressive or dominant dogs. Primarily built from steel tubing this crate is incredibly robust and well-built with a resistant to clawing and biting as well as rusting from the elements. 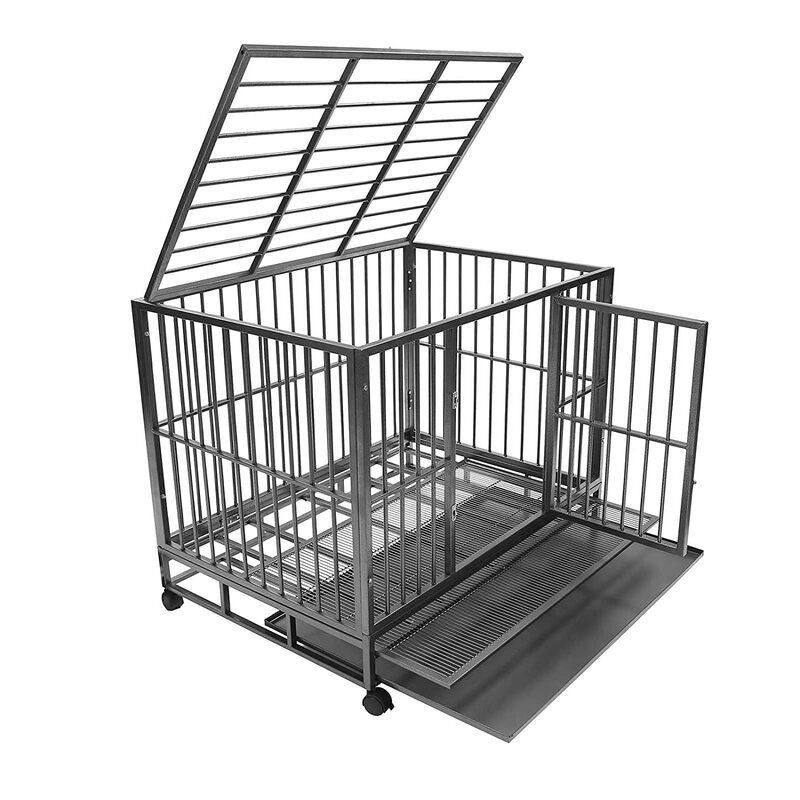 The ¾ inch frame is made from 20-gauge steel, and all stress points have been secured with heavy duty welding and the steel frame has been reinforced by steel tubing to give you one of the strongest dog crates on the market! The downside to a steel design is the weight. It would not make an ideal travel crate due to the weight and the lack of a collapsible design. It does, however, represent a great option if you only crate your dog at home. The door has very well designed heavy duty double-door latches as well as sturdy wheels that complement its robust overall design well. Excellent mobility is provided by four locking casters that are also removable which are important because the crate is quite heavy – Small 75lbs and 99lbs for the medium. The caster design is quite beneficial for those with carpets. The casters prevent long-term damage to the carpet because the weight is not distributed out across a large area. It is certainly not the most aesthetically pleasing crate on the market and is not likely to go well with home decor, but it is a very functional design and will do the job very well. This crate comes in two sizes – Medium and Large. Some owners have stated that the floor grate maybe uncomfortable for their pet however this is easily overcome by providing a dog bed on the floor of the crate or even a nice thick blanket will suffice. The function of the grate is to make it easy to clean if your dog soils themselves so there is that positive aspect to consider. As mentioned previously, as this is a steel crate, therefore, it is quite heavy. The casters do make moving it around the floor area rather easy, but it is not a crate you will want if you travel a lot. If you need mobility, you should check out aluminum made crates. There are a huge numbers of reviews online from mostly happy customers giving future buyers peace of mind. There are a few exceptions so be sure to check them out to give a balanced opinion. The Proselect Crate is a fantastic option if you have got a middle of the road budget. It is very sturdy, strong and heavy duty which will give you peace of mind especially if you own a powerful or aggressive animal. Not the most mobile of crates however what it lacks in mobility it gains in robustness. 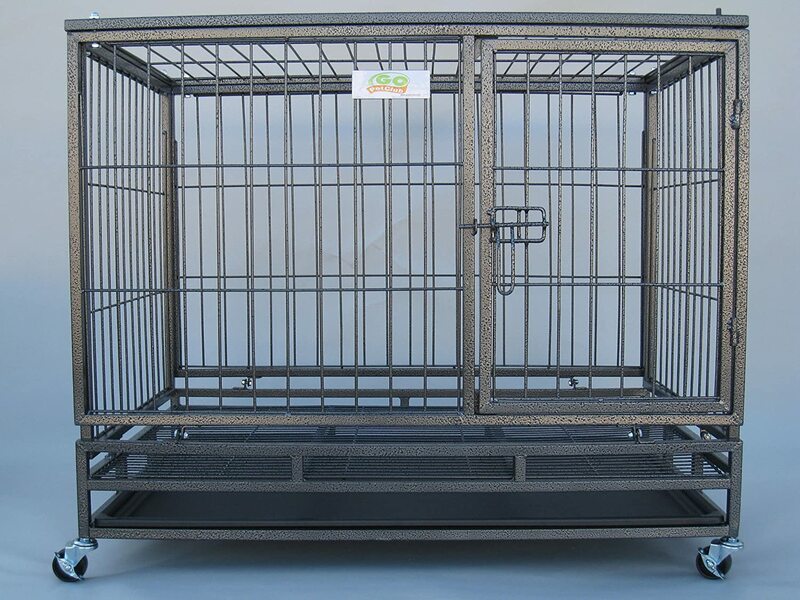 This crate is a lifelong investment and will provide your pet with a secure and safe home for many years to come. 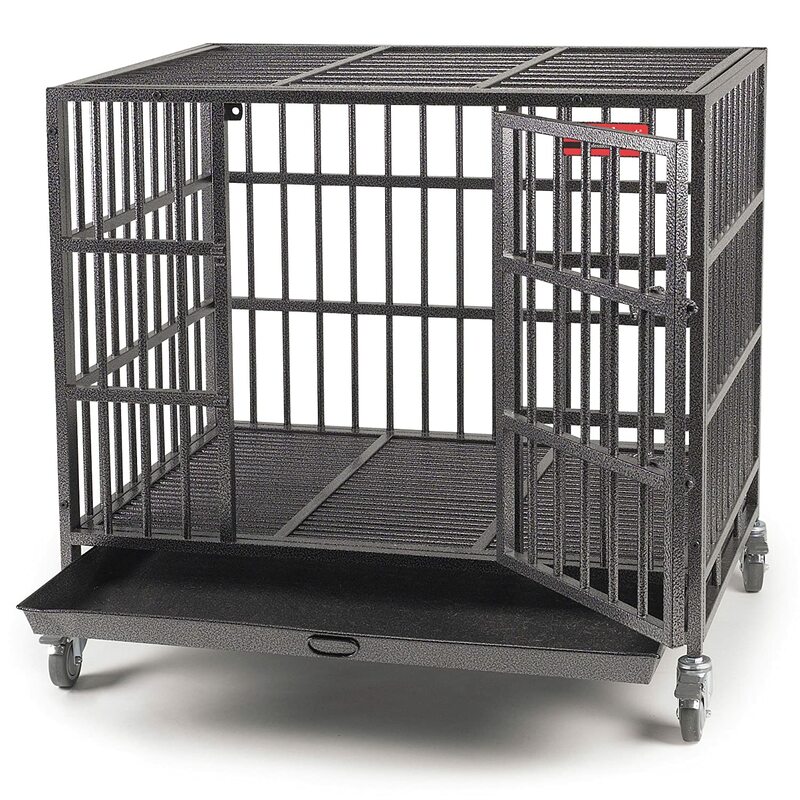 At the low end of the budget-spectrum, is the Walcut Crate which offers you a sturdy, secure crate at a low price. It is comprised of a sturdy, durable heavy duty steel frame with a double-door design that makes for easy access to your dog. Each steel bar is securely welded to form a very durable and robust construction. The doors are secured with double locks. Mobility is provided with four wheels that allow the crate to be moved across the floor with ease. Being a steel crate, it is quite heavy, but it is still ideal for traveling due to the ability to fold down. The wheels are fully lockable to prevent the crate from unintentional movement on the floor. This crate has a steel tray at the bottom that can slide out. This makes for easy cleaning if your dog has a toilet accident and allows dog poop to fall out through the grate. The tray grating does make it uncomfortable for a dog to sit on if you do not provide a doggy bed or a thick blanket to line the floor with. 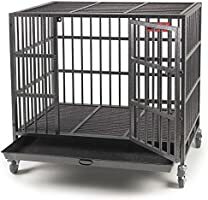 Some online reviews paint a negative picture with stories of escape dogs however due to the budget of this crate it might be a little too much to ask to contain the most powerful dogs. This crate would ideally be suited to medium-strength dogs that are not particularly aggressive or escape-prone. If you have an aggressive or adamant dog, it would be better to look at the mid-range or premium option for maximum peace of mind. The vast majority of reviews paint the picture that the crate does meet expectations for a heavy duty crate as well as being great value for money. The great majority of people agree that this is a cheap option for keeping a dog secure. 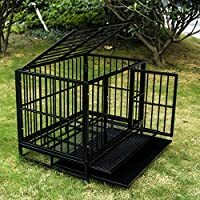 If you are on a budget, you want an above-average strength crate to keep your dog secure then this is the crate for you. The reviews and feedback are mostly positive but a few negatives to present themselves such as the bars being able to be bent in some cases and should be looked at on a case by case basis but if you are willing to overlook some of the negative aspects than this will be a value for money option. We have collected data on a range of crates that could be considered as escape-proof or extra strong and displayed them on this helpful table giving you the ability to sort via budget or other variables. An extra strong dog crate is the central aspect of escape prevention but another factor is One of the key aspects of escape prevention is to remove the desire to attempt to break out. You can do this by providing your pet with a safe toy. The best type of toy to give you is a treat dispensing toy as it gives your dog and incentive to play with it thus removing the risk of escape attempts! 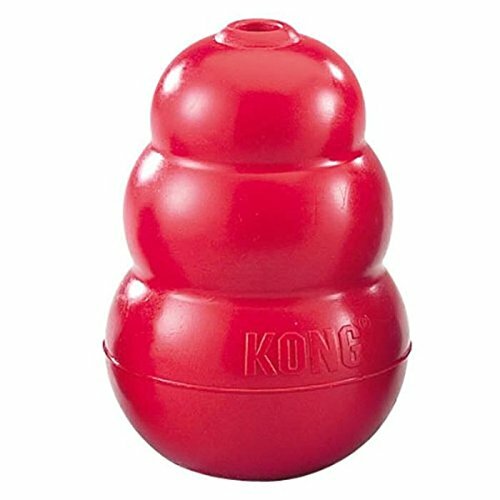 The Kong Toy is a perfect toy for bored dogs as it allows you to be able to stuff it full of treats giving your pet a challenge. This is especially important if your dog suffers from behavioral issues such as separation anxiety. The Kong Toy is made from thick rubber that is also puncture-resistant making this a long-lasting investment and furthermore it comes in a range of different sizes to suit all breeds. Separation Anxiety typically lasts for about 20 minutes, and this toy presents a challenge for roughly that time, so it is an ideal toy to have in the crate. The Kong also doubles as an interactive throw toy due to its unpredictable bounciness! 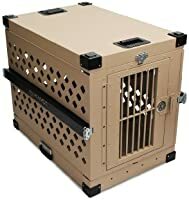 BestDogCrates.org is a participant in the Amazon Services LLC Associates Program, an affiliate advertising program designed to provide a means for sites to earn advertising fees by advertising and linking to Amazon properties.